Research packaging design and create a new look for packaging of a familiar brand taking the visual language of one brand and mixing it with another. As a starter we had in introduction to Gestalt theory with the principles of Proximity, Continuity, Similarity and Closure , and how colour can affect what we see. We looked at how we interoperate visual information which can also affect our perception of depth, perspective, size and movement and how all this can affect our graphic design decisions. With this in mind I’ve looked at four groups of packaging with the idea of pushing opposites together. First I grouped together different packages of the same kind in each group to get an overall feeling of the language being used. Following this I decided to focus on INFANT MEDICINES and CIGARETTES, as these feel strongly and ethically opposed to each other, and it would be interesting to see if they can be combined successfully. The Iconic cigarettes packaging shape is so strong and embedded deep in our psyche that even without labelling, or showing cigarettes as its content, we know the content of the package, so much so it’s rarely stated on the front that these are cigarettes. 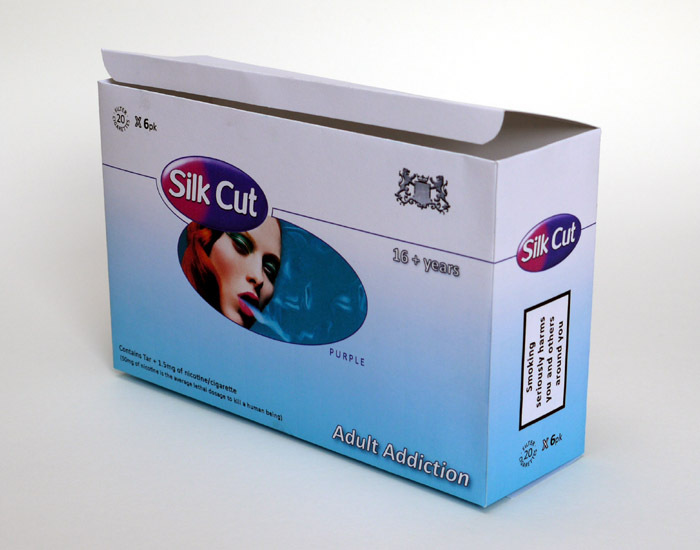 It would be a big risk for any manufacturer to take this shape of package on for any other product. Even non-smokers like me seem strangely familiar with the top brands and are able to name quite a few. Cigarettes packaging in general seems to adopt a common theme. They tend to be simple, bold , strong, stating their brand clearly with little else. Generally there is a coat of arms/crest that symbolises history, stability, tradition, strength, authenticity, quality, seal of approval. Quit a few have a metallic feel in the background texture or text, this reinforces a feeling of strength, as if made of metal. Other Calpol packaging also include a visual icon of how the medication is given. I think its it’s worth noting that Calpol have taken an interesting risk with their brand name, creating Calgel and Calcough and Calprofen. I imaging that although this seems to work, at the chemist you would likely request Caplol teething gel and Calpol cough mixture. 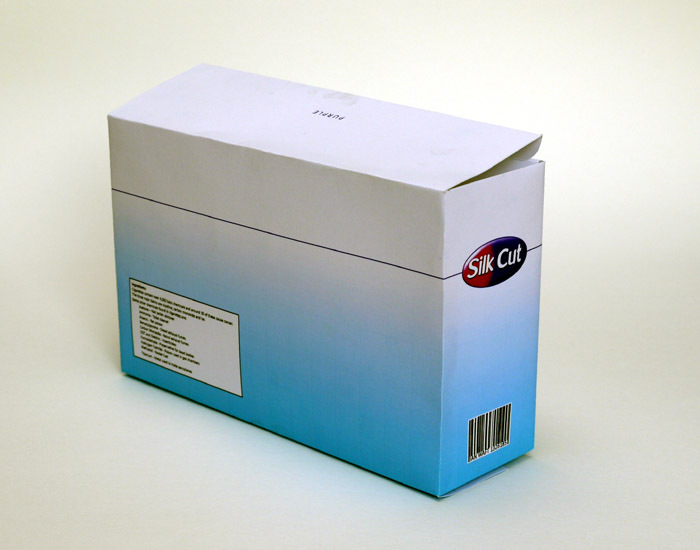 For this project I have chosen to use Calpol infant medication to re-brand Silk Cut cigarettes, picking up on the cool blue of Calgel along with their packaging’s general layout. The first task was to look closely at the Capol logo and observe the font. The closet standard font to this I found to be Calibri. 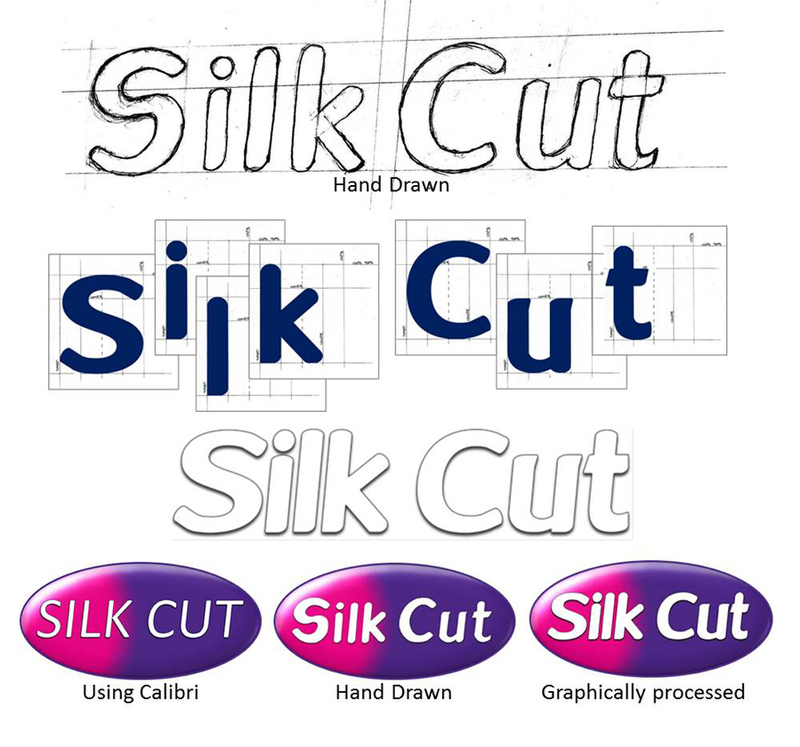 However I’ve sketched out the font, making up letters that were not available. I then enlarged this and refined these using graph paper, traced back onto copy paper and scanned into PC. From there I used Photoshop and InDesign to create vectors of these letters. Also using a mixture of programs I created a close version of the logo background ellipse. I chose the net I felt best suited the possible idea of containing cigarettes, and following some sketches, and playing with ideas, the final design was produced and refined in Illustrator. The prototype box printed and made.